It is interesting to reconcile the #52 curves with Fairrite’s datasheets. A simple reconciliation is to compare results at the frequency where µ’ and µ” curves cross over. Above is Fairrite’s characteristic curves for their #52. The µ’ and µ” curves cross over at approximately 26MHz (µ’=µ”=114), and any inductor with insignificant self capacitance should exhibit R approximately equal to X at that frequency. G3TXQ’s request for measurement of two turns was to make the self capacitance insignificant, but of course, results are also dependent on sample variation, the test fixture, and of course the AIM4170 measurement system. I have concerns about the AIM measurement system, see notes at AIM 865A produces inconsistent / incorrect results, AIM 865A Refer to Antenna facility, AIM 882 produces internally inconsistent results, AIM 882 produces internally inconsistent results – more tests. 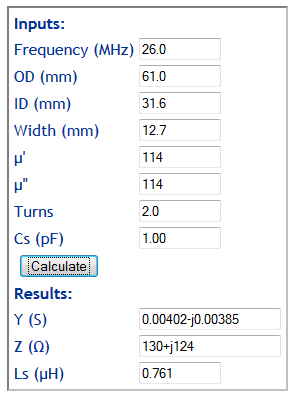 Above is a calculation of impedance based on Fairrite’s datasheet, and including 1pF of equivalent self capacitance. I should note that the model does not allow for the chamfered edges of the core, but the error is quite small. This gives almost equal R and X, the difference is caused by the self capacitance used and shows that the effect is relatively small, insignificant in the scheme of things… validating Steve’s strategy of measuring two turns (provided fixture capacitance is calibrated out). Note that the effect of very small self capacitance is to increase the R term, so we would expect measurement to give R equal to or very slightly greater than X.
Steve’s graph indicates Z=41+j142Ω at 26MHz, and whilst the X value is 15% higher than expected, the R value is 68% lower than expected. The result is quite the opposite effect of excessive self capacitance and questions the source of the sample, and sample variation. If the measurements and data reduction are correct, Fairrite’s published data is not a good predictor of the sample core’s behaviour. 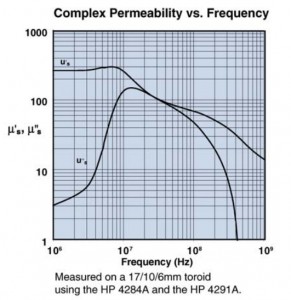 See Attempting to reconcile W5DXP & G3TXQ’s comparison of K and 52 mix ferrites #2.